Create your possibilities by finding the perfect complement to your thesis or presentation by engaging with over 200 Jesuit universities and institutions globally located. Impress your professors and advisors by utilizing the IgnitEd as your research center. 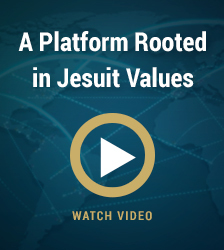 Learn from the plethora of experiences found in our collection rooted in the Jesuit tradition and core values. "The fireworks begin today. Each diploma is a lighted match. Each one of you is a fuse." Can’t find the right tool to represent your research? Connect and collaborate with other students via the User Search.